Most of us have heard of Square and Paypal Here for accepting mobile payments. I personally use Square and just recently received my Paypal Here dongle so I’ll try it out soon. These two services have something in common….you need the dongle to get the best transaction rate. You can key in the card number but you are charged a higher rate. 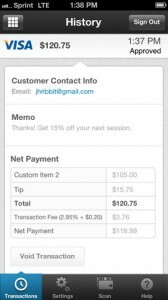 Well, enter Flint Mobile Payments, a new service that is coming out of Beta. With Flint Mobile Payments you simply take a photo of the card with your iPhone’s camera. The device submits the info to the Flint servers for processing. I like the premise here because it removes the need to keep track of another piece of hardware. Easy Credit Card Processing: The app uses your smartphone camera to take a picture of the numbers on the card. It doesn’t take a photo of the entire card and doesn’t store the photo on the device. Of course you can always key in the number if you’re having camera issues. Get Started in Minutes: Without the need for a merchant account or having to wait for a card reader you can start accepting cards as soon as you’re approved. Easy Customization: Flint Mobile Payments lets you customize your receipt as well as sales tax and tip settings right on the device. 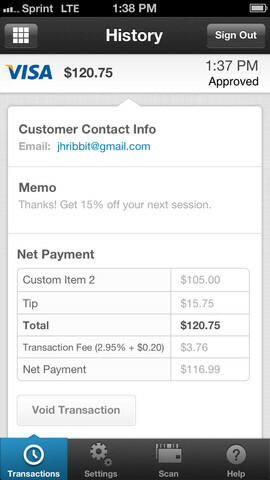 You can also set up loyalty offers and memos to customers. Integrated Social Marketing: The electronic receipt lets the customer easily post to their Facebook wall or your Facebook page right from their phone. 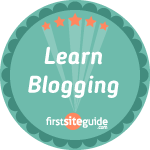 This can increase engagement which helps with your overall marketing strategy. Low Transaction Fees: Debit cards are 1.9% +.20 per transaction and credit cards are 2.95% +.20 per transaction. 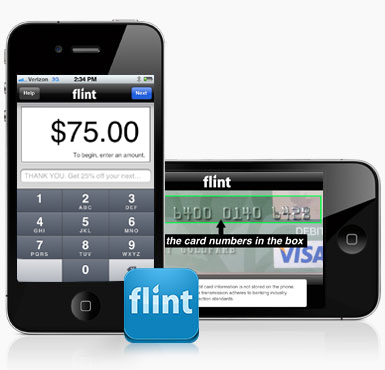 You can accept Visa and Mastercard with Flint Mobile Payments. Square has a flat 2.75% for swiped transactions and doesn’t make a distinction between debit cards and credit cards. Online Portal & Reports: The Flint Mobile Payments online portal allows you to view transactions reports as well as customize your profile and see your customer’s contact info. Get Paid Quickly: Funds are deposited into your bank account in 2 business days. Transaction Detail and Void Tool: Simply double tap the transaction and you can see all details of the transaction. Easily void a transaction from this screen. Safe and Secure: Flint Mobile Payments uses a patent pending method of scanning only the required information. The information is not stored on the mobile device. Flint Mobile Payments has a lot of promise and I look forward to giving it a shot. I have to admit that I’m pretty smitten with Square but that doesn’t mean that another company can’t come along and woo me away…maybe Flint Mobile Payments is the one.